The Mission E Cross Turismo is designed for individuals with an active lifestyle, the demand-controlled all-wheel drive easily handles varied weather conditions for practical year-round use. The interior offers plenty of cargo space while an exterior mounting system offers a solution for larger items like surfboards or bicycles. The four-seater features an emotional design with striking off-road elements as well as a new display and control concept with touchscreens and eye tracking. The concept vehicle, which is 194.8 inches long, uses 800-volt fast-charging and can also be charged via induction or a charging dock and integrates seamlessly with a Porsche home energy management system. Two synchronous electric motors with a system output of over 600 hp (440 kW) accelerate the Mission E Cross Turismo to 100 km/h (62 mph) in less than 3.5 seconds and to 200 kmh (124 mph) in under twelve seconds. This performance is in addition to a continuous power level that allows for multiple launches in succession without losing performance, which is unprecedented among electric vehicles. ‘The Mission E is an expression of how we envision the all-electric future. It combines sportiness and everyday practicality in unique style. Our vehicle will be fast to drive, but also quick to recharge and able to replicate its performance time after time,’ says Oliver Blume, CEO of Porsche AG. The road-ready Mission E Cross Turismo is a continuation of the Mission E study that Porsche presented at the Frankfurt International Motor Show (IAA) in 2015. The production car will celebrate its world premiere next year. The presentation of the Mission E Cross Turismo from Porsche at the Geneva Motor Show is a concept study of an electrically-powered “Cross-Utility Vehicle.” Designed for individuals with an active lifestyle, the demand-controlled all-wheel drive easily handles varied weather conditions for practical year-round use. The interior offers plenty of cargo space while an exterior mounting system offers a solution for larger items like surfboards or bicycles. The four-seater features an emotional design with striking off-road elements as well as a new display and control concept with touchscreens and eye tracking. The concept vehicle, which is 194.8 inches long, uses 800-volt fast-charging and can also be charged via induction or a charging dock and integrates seamlessly with a Porsche home energy management system. 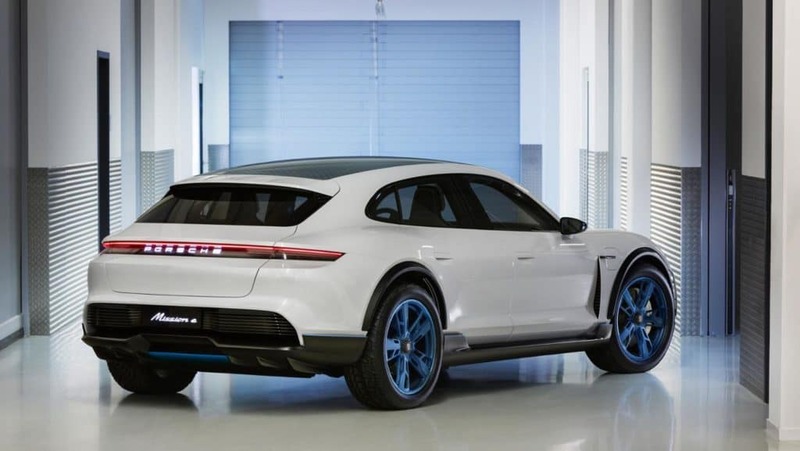 The road-ready Mission E Cross Turismo is a continuation of the Mission E study that Porsche presented at the Frankfurt International Motor Show (IAA) in 2015. The EV gives an insight into how a series-production ‘Turismo’ variant with cross-utility attributes suitable in equal measure for traveling, everyday life, and adventure could look. The 55.9-inch-tall four-seat concept is designed to be versatile. For example, a hatch is integrated into the backrests of the two individual seats in the rear to make loading long objects like skis easier. The backrests themselves can also fold. In the luggage compartment, there is a rail system with adjustable and removable belts to stow objects quickly and securely. 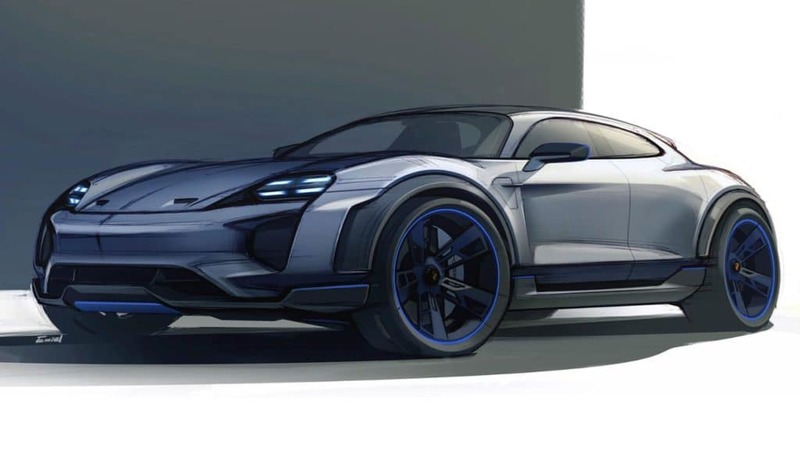 Two synchronous electric motors with a system output of over 600 hp (440 kW) accelerate the Porsche vehicle to 100 km/h (62 mph) in less than 3.5 seconds and to 200 kmh (124 mph) in under twelve seconds. This performance is in addition to a continuous power level that allows for multiple launches in succession without losing performance, which is unprecedented among electric vehicles. Demand-controlled all-wheel drive with Porsche Torque Vectoring, which automatically distributes torque to the individual wheels, transfers the power to the road. All-wheel steering contributes to the exemplary agility and stability of the vehicle, while the adaptive air suspension allows an increased clearance of up to 1.86 inches (50 mm). Porsche Dynamic Chassis Control (PDCC) is another feature available on board. This system provides active roll stabilization and prevents lateral inclination of the vehicle when cornering. It also helps reduce lateral instability over bumpy terrain. A highlight of the vehicle is a new display and control concept. Intuitive operation and information such as the head-up display optimally positioned in the driver’s field of vision enhance the driving experience. And thanks to the new connectivity solutions, the vehicle can also be perfectly integrated into a digital lifestyle. The result is a unique user experience. There are many important display and control options. Small touchscreens: These screens are situated in the multi-functional window panels (for seat adjustment and seat comfort functions) as well as in the fin-less air vents on the right and left of the dashboard. By swiping left and right on these touchscreens, the ventilation strength can be adjusted. The “smart cabin” approach simplifies operation. The vehicle settings, interior climate, and ambient lighting are all automatically adjusted to the wishes of the occupants and the respective driving situation. The driver can also access a variety of information and adjust settings away from the vehicle: Customization options from the air-conditioning system to navigation can be set in advance via a tablet, smartphone, or smartwatch. 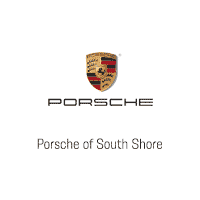 Porsche Connect already offers more than 20 digital services and apps. Porsche is adding another called the “DestinationsApp,” which demonstrates additional benefits the digital platform could offer in the near future. Using this app, a weekend trip can be planned quickly and easily in just a few steps on a smartphone. The app suggests travel destinations, enables reservations to be made quickly and effortlessly, and handles route planning. The driver can even tailor the chassis of the car to the selected route via the “DestinationsApp,” as well as choosing the most suitable music, climate control, and ambient lighting for the journey. The 800-volt architecture in the vehicle ensures that the lithium-ion battery is charged for an NEDC range of approximately 250 miles (400 kilometers) in around 15 minutes. The concept vehicle allows flexible charging both on the move and at home, and is compatible with the fast-charging network that is being established on European roads as part of the IONITY joint venture. At home or the workplace, the new Porsche EV can be charged via induction technology, and at home with a charging dock that can work in conjunction with the Porsche home energy management system. The latter option can be combined with the home’s own photovoltaic system to recharge using solar energy.